National Park Kopaonik was founded and proclaimed in 1981. It covers an area of 11.800 ha, and has a protecting belt of 19.986 ha, 689 ha of the wildlife refuge is under special peotection. The park is placed on the highest parts of the mountain. The base of the park represents mountainous, relatively levelled region of the medium height above sea - level about 1700 m. The lowest altitude is about 640 m above sea - level. The highest altitude is Pancicev vrh (2017 m). of relict kinds and vegetation of rocks. 2. Vucak - includes unique group of fir tree and juniper tree (this combination may be seen only on Zlatibor and here), as well as two groups of juniper tree, fir tree and beech tree. 3. Mrkonja - includes group of beech tree and fir tree of the preserved structure in the conditions of the degraded soil. 4. Jankova bara - the biggest pear-bog on Kopaonik, with a large number of peat-bog gruops as well as the specific groups of juniper tree, fir tree, Austrain/black and Scots pine. 5. 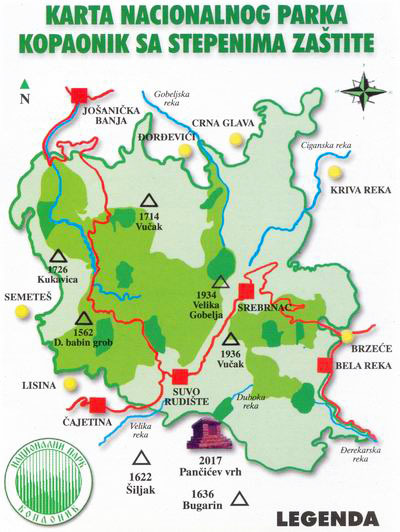 Gobelja - wildlife refuge of the representatives of the mountain, climate-regional groups and distinct groups of ostenjak with habitats of extremely rare and jeopardized species. 6. Barska reka - includes forest groups of beech tree, fir tree and juniper tree of relict character, which are important for the science. 7. Samokovska reka - includes extremely interesting and various groups of juniper tree with moss, common sorrel, wood-rush and others, as well as vegetation of peat-bog. 8. Metodje - includes six phytocoenologically different groups of juniper and beech trees and the number of other rare and relict plant spacies. 9. Jelak - includes interesting ecosystem of beech and fir inside which wee meet important and rare species - yew - tree. 10. Suvo Rudiste - characteristic representative of the mountainous region at the top border of the forest vegetation with groups of climate-regional groups of blueberry, juniper bush and sub - alpine juniper tree, as well as with the groups of tipac and metlicasta vlasulja. 11. Duboka - in the municipality Brus - includes parts of relict group of beech tree with bulrush, as well as group of beech tree with hornbeam (a unique group on Kopaonik). 12. Jelovarnik - hydological and geomorfological monument, fall with three cascades of hight 70m, surrounded with intteresting ecosystem of beech and junipertree, rocks and waterfals. 13. Bele stene - (Withe rocks) - geologocal monument rocks massif of the limestone at the upper border of the vegetation in community with bluberry, juniper bush and junipertree.